The week before December 13 was one of singing for me. It was the week before Santa Lucia and even if I normally have a couple of performances a year when I am in Sweden it is always more intensive when I am abroad as there is always a high demand for Lucia performers among Swedish companies and representations. My first year in Paris I had over 20 performances in a week. This year was less hectic and I only did six performances mainly for different events organized by the Swedish embassy. And even if this particular ensemble was not the most professional I have been singing with (mainly Swedish au-pairs and almost all of them blond and super pretty, well fulfilling the stereotype of Swedish girls) it did get me into Christmas mood. But best of all was that the Swedish opera singer Mats Carlsson sang during two of our performances at the House of Sweden. He sang O Holey Night or Adam’s Song (Adolphe Adam) and I it was a magnificent experience – I have rarely heard anything alike. It was amazing and an honour to have had the opportunity to sing at the same occasion as him. Note that the pictures are not mine, they are from swedishscene.com and swedenabroad.com. For all of you who are not familiar with the Swedish tradition it dates back to the days when the Catholic Church tried to do away with old pagan tradition that persisted up in the cold North. This particular one was on the longest night of the year when the Vikings had a mid-winter feast with a little too much food and alcohol to be really appreciated by the church which wanted to give this day a new tradition. This in the then Julian calendar was the day of Saint Lucia – the saint of light. Hence the tradition of celebrating Santa Lucia arose. Eventually with the change of calendar to the Gregorian this day ended up on December 13 and many hundred years later (and a lot happened in between), today’s tradition started taking shape. On the morning of the 13 before the sun rise, a girl dressed in a white nightgown with long red silk belt and a crown of candles leads a choir of “handmaids” and “star boys”. They tradition is that they come with breakfast and they sing specific Lucia songs but sometimes also Swedish Christmas carols. Kids wake up their parents in the morning with coffee and Lucia (saffron) buns as well as do performances in kindergarten and in schools. And with less strict gender roles, boys are now a days now also allowed to be Lucias. 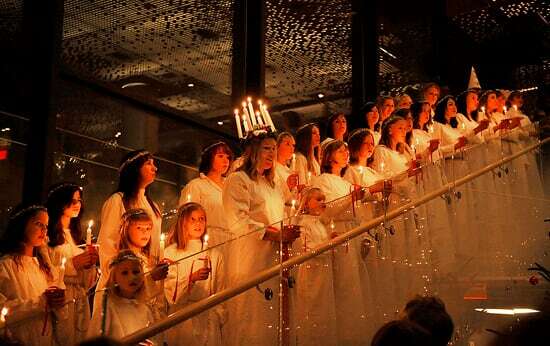 There are also real Lucia concerts all over Stockholm and Sweden sometimes with several hundred singers. It is a very peaceful and non commercialized tradition that brightens up some of the darkest days of the year.